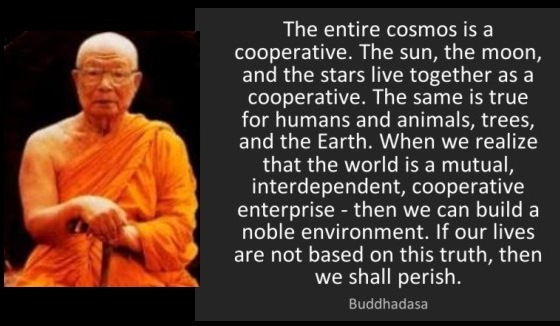 I thought the following quote and the article after it was very relevant to the world today and to our "Buddhism and the Environment" forum. "The entire cosmos is interdependent. The sun, the moon and the stars interact depending on the startup conditions of this particular universe. The same is true for humans and other animals, for trees and plants and anything else living on the Earth. When we realise this we can help maintain the environment and not destroy it, else we perish." If we are to be mindful in Buddhism, then we look at nature as it is, not how we would like it to be in some fanciful belief system. To be a little less harsh, I wouldn't have minded the quote so much if it had said, "Let's imagine the universe as if it were a huge cooperative enterprise (that isn't going to destroy itself in a few billion years, taking with it all traces of life)." Philg. I understand what you are saying -that you don't like the way that Ven. Buddhadasa Bhikkhu has expressed himself. He's anthropomorphised natural objects, and that's leaning towards magical talk. But it's also possible to read his statement as allegory, where there's no need to accept it as literally true, only a need to see the similarity that the speaker is pointing out. With respect, your own paraphrase could be criticised as relying too much on the accepted notions of cosmology. It's thus reduced to promoting a science-only world view, one that could be described as narrow and blinkered. I'm not making that criticism, merely pointing out that it's ever so difficult to encapsulate in a few words the fact that we all depend on each other and we have to look after this planet. Thanks for taking time to respond. I don't mind criticism. It's the only way to learn, even if I don't agree with a comment, it helps me learn about how other people think about things. I guess my last comment, about imagining the universe would have been better, for what I wanted to say, if I had said, "What if the universe really was a huge cooperative enterprise, what would it mean for us?" is a useful question to ponder. I like "What if?" questions. And allegorical statements. I guess, "What if the universe was only the result of forces explainable at a scientific cosmological level?" is an interesting question I have often asked myself. What would that mean for me as a Buddhist? It turns out that I'm perfectly fine with the idea, but I can see that it might be challenging for others. In terms of interpreting the world I've long accepted the value of multidisciplinary approaches. Science can tell us about what the moon is and how it was formed, and so on, but not in the same way that poetry can describe how it feels to be stood in awe at a moonrise, or how art can depict it in ways that may not exist, but are nevertheless valuable to experience. The only reason I took up meditation was to see if I could 'see' the world in different ways and, what do you know, it worked. I was touched by what Ajahn Buddhadasa had to say because human beings share this planet Earth with many kinds of flora and fauna as well as with each other, so obviously we are connected in that way. Tragically, as well as frequently arguing with and abusing and killing many of our own species, we have already caused the extinction of other species of animals and plants, polluted the air we breath, as well as the land and the seas, and caused irreversible climate change. I only disagree with the strong anthropomorphic language he uses for what goes on in nature. For many years I took groups of children to The Centre for Alternative Technology in Wales where the people there created a new ecosystem from an old sterile slate quarry. They are also completely self sufficient in energy, using water, wind and solar power. We can create as easily as we can destroy. We can 'cooperate' with nature, although I'm pretty certain that nature doesn't actively cooperate at any level. It just is. The onus is on us, as human beings, to see it for what it really is and to care for it as only reasoning beings can. We can only really care for it if we understand what it really is, the nature of its interrelatedness, the fundamental patterns underlying how things interact, and so on. Too many people think that the ecosystem is far less fragile than it really is, yet our future depends on it. The science is pretty indisputable, but science isn't enough, or we wouldn't be on the verge of destroying the only habitable place we have access to. Hence the need for other ways to persuade everyone to treat the world as if it were our own bodies, be it via the arts, political activism, or as Buddhists.